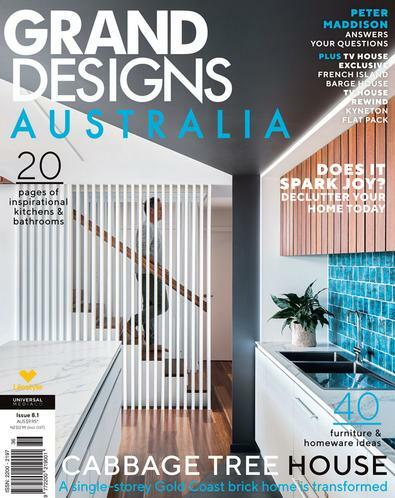 Subscribe to Grand Designs Australia magazine for 6 months & save 41% off! Offer expires 16.05.2019. Available to AUS residents only. Offer applies to 6 month subscriptions only. If you're interested in renovating, building and decorating and want information from a team of industry experts in lighting, heating, flooring, interiors, colour, sustainable design and so much more, you must subscribe to Grand Designs Australia magazine.Grand Designs Australia magazine is an exciting new venture into the home design and renovation market. Each issue will feature houses comprised of a diversity of styles and budgets; some will be new builds, others conversions or renovations. Each will showcase the project from concept to completion and will demonstrate how the architect or designer, builder and homeowner worked together. A magazine subscription to Grand Designs Australia also makes a great gift.Why not subscribe to this quarterly title to help create the house of your dreams? I really enjoyed this magazine, I received it as gift and it gave me a lot of great ideas. The range of mags available at isubscribe is fantastic! So many more titles are available compared to what you can get at a newsagency. I love knowing I won&apos;t miss a publication and I always receive my magazine on time. Thanks isubscribe!